Advantages: Excellent coverage of subject matter including history, tactics, uniforms and equipment; high quality colour plates supporting text. Among the latest releases from Osprey in their Elite series is No 103 ‘Vietnam ANZACs: Australian and New Zealand Troops in Vietnam 1962-72’. Written and illustrated by Kevin Lyles this work covers the involvement of the armies of Australia and New Zealand in the Vietnam conflict between 1962 and 1972. I will admit up front that I provided Kevin with material from files held by the Australian War Memorial. So what do you get? Vietnam ANZACs contains 64 pages, of which 8 are pages of Kevins colour plates and approximately 50 photographs. Roughly, it can be divided into three parts, a historical precis of ANZAC involvement, an overview of ANZAC tactical doctrine, while the final part covers uniforms and equipment. It is this final part that is the real value of this book as far as I’m concerned. The second part covers ANZAC doctrine, as well as a short case study covering the battle of Long Tan on 18 August 1966 and concludes with a discussion of the activities of the ‘elite’ Special Air Service Regiment. Readers should note that the doctrine section is really talking about infantry doctrine, however, it is not unsurprising that due to space limitations this doesn’t cover the other ‘Arms” corps such as Armour, Artillery or Engineers. The section on the SASR provides a number of new and useful pieces of information covering official attitudes towards shaving, and personal equipment specified in the 1971 unit Standing Operating Procedures. This is all useful information, especially for the scale modeler. The final section of the book covers weapons, uniforms and equipment. It takes up nearly half of the book, and it is this part, along with the artwork, that I believe makes this book a must for the scale modeller, collector or re-enactor. The reason is really simple… its the first book that really covers these items together and in detail. The uniform section covers the various shirts, trousers, headwear and boots. Webbing items are then covered including the use of items of British 1937 and 1944 pattern webbing items along with the American M1956 webbing. Packs, rations, munitions and other smaller equipment items are also covered. New Zealand uniforms and equipment also get a similar treatment. 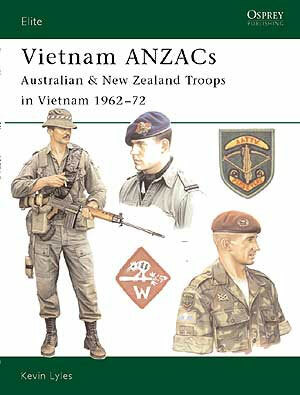 The book concludes with an examination of the uniforms and equipment of the Australian and New Zealand SAS. Again much of this is new and highly informative for the scale modeller. Supporting the text are Kevin’s really beautiful plates. I have to admit that he ranks equally with Ron Volstad as one of my favorite Osprey artists. Two pages of plates show the various uniform combinations worn by the AATTV. A further two pages are devoted to SAS uniforms. A single pages covers pilots, tank and APC crewmen. The remaining plates cover infantrymen, providing a snapshot of early, mid and late war uniforms and equipment. The period photos are from both private individuals and the collection of the Australian War Memorial. They amply support the points being made in the text. Alongside these are a couple of photos of webbing sets laid out to show their components. In conclusion, just in case you haven’t worked it out by now, I’m very enthusiastic about this book. ANZAC uniforms and equipment from the Vietnam War have received scant attention to date and this title provides a good start on the subject. I liked the discussion on ANZAC doctrine the least as this is a complex subject even if I don’t fully agree with some of the conclusions reached. To adequately cover the subject would probably take a couple of volumes. This aside, as a scale modeller with a major interest in this period, I now have a volume that provides an easy to read reference for ANZAC uniforms. Whats more… the icing on the cake is the beautiful plates. An essential reference on this subject.